We specialise in selling art nouveau glass and art deco glass by Lalique, Galle , Daum, D'Argental, Schneider, Legras, Goupy, Baccarat, Moser, Loetz, Kralik, Rindskopf, Harrach, Pallme Koenig, Riedel, Josephenenhutte, Fritz Heckert, Steinschonau, L C Tiffany, Monart and other great makers of glass between 1875 and 1955. As well as our web shop we also show at many specialist antique fairs. Click on this link to find out Where to Find Us. Welcome to our website exclusively featuring the works of the three great masters of French glass Rene Lalique, Emile Galle & Daum Nancy, together with some special featured collections. To see wonderful art glass by all the other great glass makers please go to our other websites www.MandDMoir.com and British Glass and Glass Jewellery. Please remember to add these websites to your favourites too! Week beginning 15th April 2019. Recently we have added many new items to all our websites. Also see us featured in the 'Financial Times' FT on Galle and one of our best vases can be seen here Telegraph -Luxury! There are nearly 400 pictured items for sale on this website and it's partner sites www.MandDMoir.com and British Glass and Glass Jewellery. These are live sites, new items are added EVERY week, usually by late (UK time) on Monday. All our items are original, i.e. to the best of our knowledge made at the factory of the named maker on or close to the dates given. We do not sell any reproductions or fakes. Unless otherwise stated all our pieces are perfect, without visible chips, cracks or other defects. All our items are between 70 and 120 years old so there are usually wear marks and minor scratches. We are happy to provide any prospective buyers with further photos and detailed description reports if required. We are UK based, but we sell our glass worldwide. 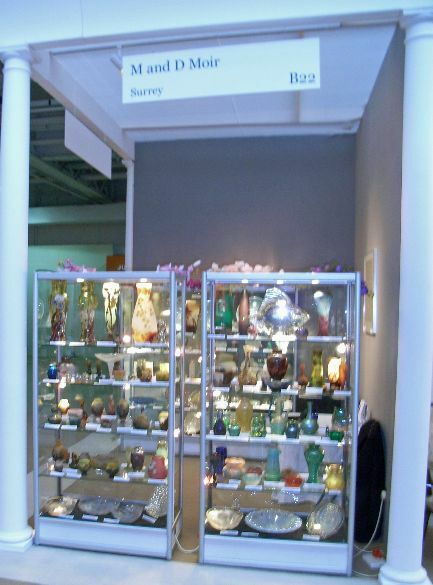 We have been dealing in glass for over 18 years. You can buy items from us directly by E-mailing us [email protected] or phone or text us on: 07843 022591 (inside UK) or +447843 022591 (outside UK) - or by finding us at one of the major UK fairs and shows we do see Where to Find Us. We are also regularly published in a range of antiques and collectors' magazines in the UK. Additionally for the last few years we've acted as consultant for Miller's Antique and Collectables guides. As is usual with an antiques business the price you actually pay will be 10-15% less than our listed prices, plus, if required, postage (including insurance) which we charge at actual cost. We always try to respond to serious enquiries within 48 hours, but often incompatible email systems mean your email may not get through or our reply may get blocked by your spam filter. -if you email us and have not heard back within two days PLEASE phone or text us and we'll get right back to you. This website now has two addresses www.ReneLaliqueGlass.com and www.GalleCameo.com and our email address is [email protected]. Please note replies will come from [email protected] You may need to make sure your spam blocker does not block them. If you like our glass please remember to put us on your favourites, see and then 'Like' us on Facebook for news and updates and please tell you friends about us! Worldwide we accept UK £ (pound) cheques, Paypal, and bank transfers via IBAN. We can also take debit cards and all the major credit cards (MasterCard and Visa) via phone. Please email or call us to learn more about any of these payment methods. Buying internationally is amazingly smooth; recently we have supplied our glass to the UK, USA, Japan, Singapore, South Africa, Australia, New Zealand, Austria, Belgium, France, Germany, Luxembourg, Italy and Norway. Please remember that any charges for your own country's import duties is the responsibility of the buyer. 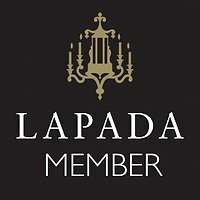 If you are familiar with the art nouveau and art deco glass of Lalique, Galle , Daum, Schneider, Legras, Goupy, Moser, Loetz, Kralik, Rindskopf, Harrach, Pallme Koenig, Riedel, Josephenenhutte, Fritz Heckert, L C Tiffany, Monart just click on them, and you will be taken directly to fine pieces of glass from the maker of your choice. If you'd like to know more about the makers first, for Lalique, Galle and Daum please scroll down below for some brief histories. For brief histories of all the others please click on www.MandDMoir.com and scroll down the page. The great glass makers of the 20th century always seemed to manage to be at the heart of key historic events rather than isolated away from them. It's interesting to note that all the major European glass makers were located in lands whose nationality was hotly disputed during the century. The great glass makers seem to come in two main types, the great designers/design houses who used glass as one method of expression (Rene Lalique, Galle, Tiffany, even WMF) or the great glass houses who keep up with 'modern' changing designs (Loetz, Moser, Daum). Collecting glass from these great makers, often referred to collectively as the masters of art glass, has become a major new interest for lots of serious collectors and investors. Often better investments than banks and shares, you also get something magnificent to display. Rene Lalique was born 1860, and died 1945. After his first career as a jeweller and being crowned the greatest art nouveau jeweller, at the 1900 Paris exhibition, he went on to become the greatest art deco glass maker. His earliest pieces of glass date from 1910 and even before, but his main production of glass really took off in 1921, after the French Government gave him a factory, on land repossessed from Germany, in Wingen Sur Moder, Alsace. Rene Lalique, is probably best known for; amazing vases, car mascots, scent bottles and his trade mark opalescent coloured bowls and figures. In fact he made a wide variety of other things, almost anything that could made in glass, and even a few things that should never have been made in glass. He designed an amazing range of over a 100 patterns of tableware, including glasses and often bowls and plates. He also made; a wide range of magnificent lighting, jewellery, boxes, desk and toilette sets, and the list is endless. After Rene died in 1945, his son, Marc, removed the ‘R’ from their normal ‘R Lalique’ signature making it easier to identifying proper Rene Lalique from later factory pieces. The most collectible Rene Lalique glass is the pre 1946 glass signed R Lalique. Over the years his glass has remained probably the most popular and consistent areas of art glass collecting. There has been much greater interest in his glass over the last few years as it is so often praised and shown on TV antiques programmes. 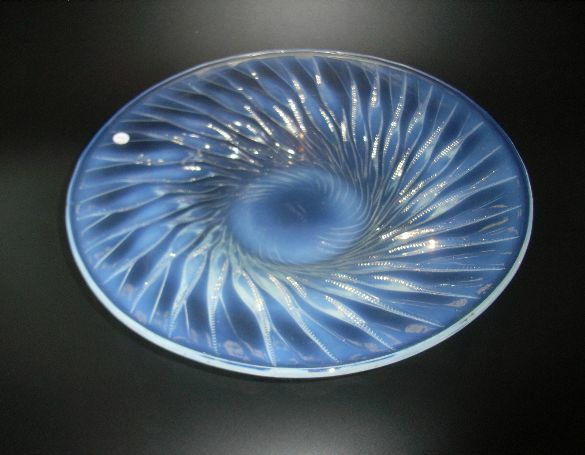 We believe we have the largest selection of Rene Lalique Glass on the Web. We specialise in smaller unusual pieces, especially tableware, plates, bowls glasses and decanters. We also specialise in cachets, table decorations, paperweights, as well as a wide selection of vases. On the larger size we also have some of the wonderful chargers and occasionally ceiling and wall lights. If you have lost or broken Rene Lalique items from tableware sets we provide a pattern search service and have glasses from many patterns in stock. To see our selection of Rene Lalique Glass use the menu at the top left -where we have NINE pages covering many different aspect of his works. (Best Reference : Emile Galle et le Verre -Muse De Ecole de Nancy (French Language) & Emile Galle and the Ecole De Nancy -Christian Debize (English Language))(Best Museum Collection : Museum De Ecole De Nancy -Nancy, France). Like René Lalique, Emile Gallé did not start out manufacturing glass, he also made furniture and porcelain. This factory was based in Nancy France and he was the founder of the famous Nancy School. 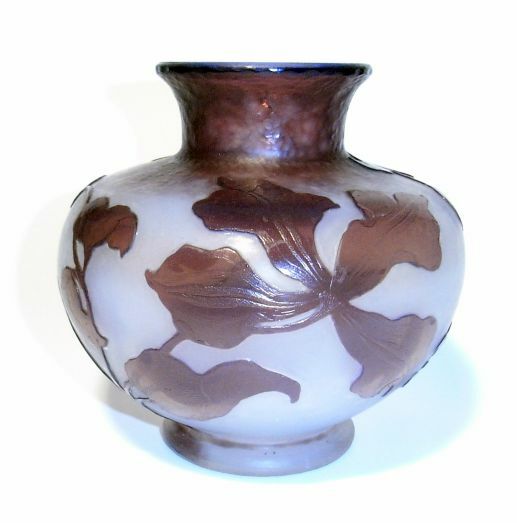 By 1900 he was the undisputed greatest art nouveau glass maker in the world. 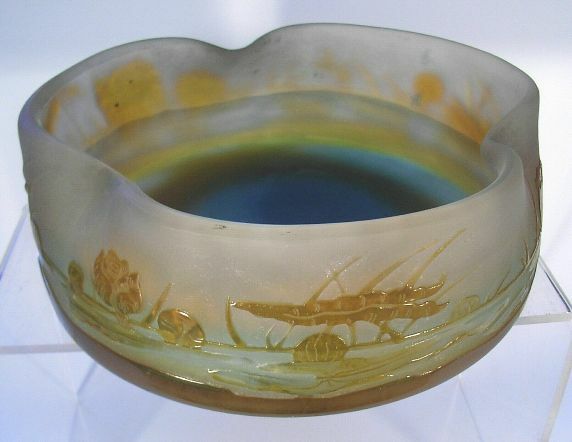 The Emile Gallé glass works effectively had three different phases, the 1st period, which was predominantly fine enamelled pieces, was quite similar to those produced by many contemporaries, Then in the mid to late 1890s the main production moved to art nouveau style Cameo glass ranging from the small and simple to the seriously fantastical. 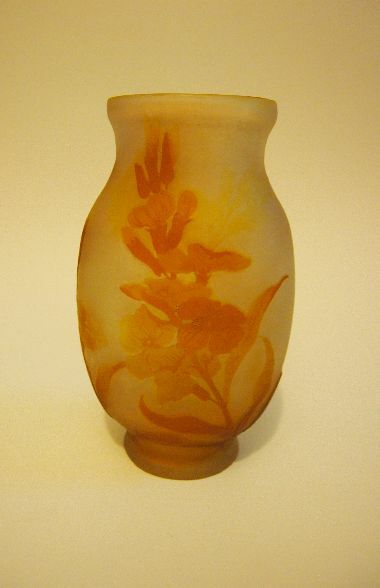 Finally after Emile Gallé died the works started producing larger more art deco cameo vases. We have the widest range of original Emile Galle cameo on the web. We specialise in a wide range of Galle cameo vases and bowls, dating from 1895 up to about 1920 and covering the classic botanicals, landscapes and aquatics. Please use the menu at the top left to access our three Emile Galle Cameo pages. Amazingly the Daum family acquired their glass works as part of a bad debt, in the 1880s Daum the elder had been investing for some years in glassworks in Lorraine, when the family found they owned one of their own they decided to take it on themselves. Although Daum have often been accused of being mere followers of Emile Gallé, the Daum family produced some of the greatest art nouveau and art deco glass of the late 19th and early to mid 20th century. Daum produced great glass cameo works in the art nouveau period; alas many of these are out of the range of every day collectors. They also produced some fine acid cut pieces, enamelled cameo glass pieces, vitrified pieces and, as art nouveau turned into art deco, they produced some magnificent polished brightly coloured glass known as 'Jades'. Later in the art deco period they followed the fashion for heavier deeply acid cut glass pieces. Daum also set up a number of short lived 'sister' glass works such as the Cristallerie De Nancy and the Verriers d'art Lorrain, the latter was managed by one of Rene Lalique's old employees Pierre d'Avesn. After the war Daum dropped the 'Nancy' and 'Cross of Lorraine' from their signature. The main collecting areas for Daum are of course the magnificent cameos and their works up to the end of the Second World War. Within art glass collecting Daum glass remains one of the most solid and stable areas; prices tend to increase steadily and it remains definitely in fashion. We specialise Daum enamelled cameos and early acid cut back pieces, also vitrified glass and the jades. To see our selection of Daum Glass use the menu at the top left. Finally, if you are looking for any Art Nouveau Glass or Art Deco Glass please let us know. If you can't see what you want here, we may well be able to find it for you. If you have any original Art Nouveau Glass or Art Deco Glass especially Lalique, Galle, or Daum in perfect condition that you wish to sell please do contact us - but please first check the kind of things we do sell. If what you want to sell is very different from the kind of glass we have shown here, we are much less likely to be interested.